A cicada-killer wasp drags its prey, a cicada that has been paralyzed by the wasp’s sting. The wasp is big – about two inches long – but the cicada is bigger and will be stashed in the wasp’s nest hole as food for the wasp’s young. This July and August, have you seen any huge wasps – a fearsome two inches long – flying around and perhaps going into holes in sandy ground? If so, you probably went out of your way to avoid them, thinking that wasps that big have got to be nasty, ill-tempered creatures that are likely to sting you. But as long as you’re not a cicada – one of those insects that make a long, loud buzzing that grows in loudness on hot summer days – you probably have nothing to fear. These wasps are generally quite peaceable. They’re called eastern cicada-killer wasps (Sphecius speciosus), and for good reason. They have no interest in people, but they hunt cicadas, paralyze them with their sting, and drag them off to their underground burrows – no small feat, since the cicadas are typically bigger than the wasps. There the wasps stash the cicadas as food for their developing young. If this makes you think of certain scenes from the “Aliens” movies, you’re not alone in wondering if this kind of wasp life-style might have provided some inspiration for the creators of those horror movies. Fortunately, wasps are predators of insects, not people. Big as they are, cicada-killer wasps are not likely to sting you. Only female cicada-killers hunt cicadas. Why? The reason is that only females have a stinger. (The stinger is a modified egg-laying organ connected to poison glands.) Fortunately, the females do not have the nest-protecting instinct that makes hornets and honeybees so aggressive if you come near their nest. The male cicada-killers are territorial and might fly up to you and hover, but they can’t sting. Before setting out to hunt, a female cicada-killer first digs a nest hole about a foot deep in sandy soil. She fashions an oval chamber at the end of it, large enough to hold two or three cicadas and one of her young. Then she flies away after circling a few times in the air above her burrow, presumably to memorize landmarks for its location. She flies among the trees, looking for cicadas. Most of the cicadas she captures are females, which don’t make a buzzing song, so she probably finds her prey by sight rather than sound. When she has stored two or three paralyzed cicadas in the chamber, she lays a single egg in it and seals up the chamber. Because the cicadas are paralyzed, they stay fresh longer than they would if they were dead. Then she digs another tunnel as a branch off the original one, and repeats the process of provisioning a chamber with cicadas, laying an egg, and closing off the chamber. Eventually she makes about 15 such chambers. The connected tunnels can be 4- or 5-feet long. Each egg hatches a grub-like wasp larva after two or three days. The larva eats the cicadas and grows for about 10 days. In the fall, the larva spins itself a case of silk and overwinters in a dormant state in the underground chamber until spring, when it transforms into an adult wasp. In late June, a new generation of cicada-killer wasps emerges from the ground. As adults, they feed on nectar and juice from their prey. Cicada-killers are solitary wasps. Each female makes her own nest and provisions her own young. Many of these wasps may live near one another in the same area, forming colonies of more than 100 wasps. Look for their tunnels in sandy areas at the edges of sidewalks and patios, and in gardens, lawns, and flower beds. The entrance holes are about the size of a quarter, often with the dug-up soil just outside. Nearby there are usually trees where cicadas live. Cicada-killers are just one kind of digger wasp. The different kinds specialize in storing different kinds of insects for their young. For example, American sand wasps (Bembix americana spinolae) catch flies for their young. Cricket wasps (Liris argentatus) hunt and paralyze crickets for their larvae. One kind of weevil wasp (Cerceris halone) collects acorn weevils. Another digger wasp (Psen erythropoda) specializes in hunting spittlebugs. And the list goes on. What about the hapless cicadas? We hear them but rarely see them. If you’ve ever found a large, tan, empty insect “skin” (really an external skeleton) on a tree trunk or on the ground, you’ve found evidence of a cicada. There are many species of cicadas, but the common ones in the northeastern U.S. are known as dog-day cicadas (Tibicen canicularis). Their daytime buzzing song is one of our familiar sounds of summer in August and September, when the males sing to attract females. Their song also attracts other males, so lots of males end up singing together in the same tree. This loud buzzing chorus brings the silent females from far and wide. After mating, the female cicadas make slits in tree twigs and lay eggs in them. The eggs hatch into immature wingless forms known as nymphs, which drop to the ground and tunnel down. There they feed on sap from tree roots and gradually mature underground for one year or more. We’ve heard a lot this year about 17-year and 13-year cicadas, which mature underground for 17 years and 13 years, respectively, but the common dog-day cicadas that we hear in the “dog days” of summer mature in about 3 years. Some of them mature every year. They tunnel out, climb a tree, and shed their skin one last time, exiting through a split in the skin along the top. How do cicadas make their distinctive sound? They have special sound organs on the underside of their body. Muscles vibrate a membrane that makes a clicking sound, which resonates in hollow portions of the cicada’s body. At about 400 clicks per second, the song sounds like a buzz to us. Fortunately, cicada-killer wasps don’t get all of our cicadas. Enjoy the cicadas’ song and other insect songs of summer. 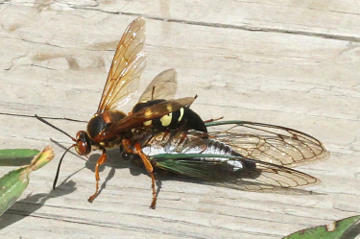 Look for empty cicada skins and watch for cicada-killer wasps and their tunnels. Think of all the wasps that prey on insects, helping to keep them under control. Many thanks to the readers who first called our attention to cicada-killer wasps several years ago!